Best Corporate Real Estate is a recognized expert in Commercial and Investment Real Estate. We provide valuable resources to the commercial owner/tenant to carry out their Real Estate needs. Whether it be sales/purchase, leasing or development, Best Corporate Real Estate can be your resource from idea origination to assistance after the transaction. Best Corporate Real Estate is well known within the Central Ohio market as an industry leader with diversity in all specializations of real estate transactions. Combined, our staff has over 100 years of real estate experience. 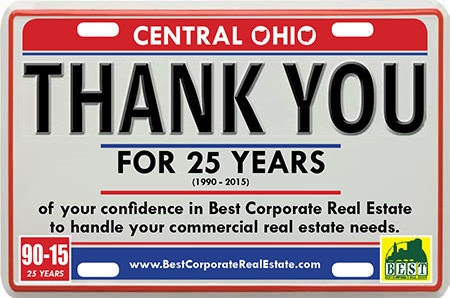 For over 20 years, we have been ranked in the top Central Ohio Commercial Brokers.